Gangri Thökar (Tib. གངས་རི་ཐོད་དཀར་, Wyl. gangs ri thod dkar), literally 'The White Skull Snow Mountain', is a famous peak in Central Tibet, approximately 25km S-SW of Lhasa. It was here, in the hermitage of Orgyen Dzong, that Longchenpa taught and composed many of his most important writings. 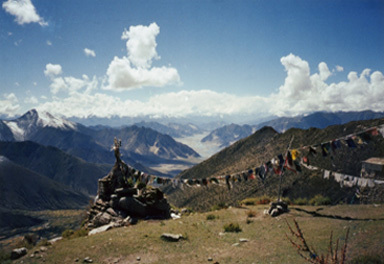 Centuries later, Lochen Chönyi Zangmo founded Shuksep Nunnery on the mountain's lower slopes. Use Google Earth for a view from the Retreat Place: Gangri Thökar - as also shown on the cover of Tulku Thondup's translation of Longchen Rabjam's The Practice of Dzogchen.